LARRY BISIG grew up in Louisville, Kentucky, where he went to Catholic school and where he now runs a local marketing firm. He has seen his local school district's history from several angles. In 1975, when a court-ordered desegregation drive began, his public-school friends started waking up at five o'clock to be bussed to new schools across town. His Catholic school made reassuring intercom announcements, saying that the public-school buses had arrived safely—despite the violent protests and threats. And he remembers the sudden influx of new students into his own school, as white Protestant families chose a Catholic education for their children rather than sending them to public school with blacks. By the 1990s, however, the Jefferson County school district, which includes Louisville, was far more racially integrated (see chart). Its public schools had also become much more attractive to the white families who had stayed in the district, and Catholic schools had such a hard time keeping students that Mr Bisig's marketing firm began working with some of them to handle the stiffer competition. These days, Jefferson County is eager to keep the racially integrated school system it has created. But that integration—which began with a federal court order driven by Supreme Court precedents—is now under threat from the Supreme Court itself. The court's two newest justices—Samuel Alito and the chief justice, John Roberts—are serving their first full term together in 2006-07. And although the new court has sometimes aligned in unexpected ways, George Bush's two appointees have given a more conservative tilt to some important decisions. Most notable was a five-to-four ruling last week upholding a congressional ban on partial-birth abortions. Sandra Day O'Connor, a moderate, had previously provided a pivotal vote against abortion restrictions. Last week's ruling thus seemed to confirm that her replacement by Justice Alito will lead to a conservative shift in at least some types of cases. Race-conscious education policy, which Justice O'Connor broadly favoured, is among the areas most likely to change. In the coming weeks the court will announce its decision on a pair of cases that it heard in December, involving the Jefferson County school district and another in Seattle. Both districts act aggressively to maintain racial balance in their schools, but may not be able to continue. In Seattle, where places in the most popular high schools are scarce, officials use race to decide who gets left out, so that a school's racial mix will not deviate too much from the district average. Jefferson County uses a broadly similar system to ensure that black students, who are 35% of the total, make up 15% to 50% of the student mix in every school. A white student's mother has claimed that he was deprived of a good school place there to preserve this racial mix, violating his rights. Lower courts have upheld both districts' methods, but the newly conservative Supreme Court is examining the issue. Even without this judicial complication, America's school boards are being sorely tested by economics and geography. Blacks and whites still tend to earn different incomes and live in different areas. And those stark facts undermine many districts' efforts to foster racially integrated schools and equal education. As a result, 53 years after Brown v Board of Education—in which the Supreme Court declared school segregation to be unconstitutional—the gulf between blacks' and whites' educational attainment remains glaringly wide. The winning lawyer in the Brown case was Thurgood Marshall, a descendent of slaves who would later become a Supreme Court justice himself. When the court issued its unanimous opinion that “separate educational facilities are inherently unequal”, Marshall was so pleased with the decision that he said “we hit the jackpot”. For the past five decades, America's judges, politicians and school boards have wrestled with the challenges of putting the court's principle into practice. Despite all the integration that these reforms have achieved, however, Marshall's jackpot has so far brought only a fraction of the equality that it once seemed to promise. Segregation no longer has the force of law, but it is still a fact of life in most cities. Many districts are actually going backwards, as Charles Clotfelter of Duke University documented in a 2004 book, “After Brown: the Rise and Retreat of School Desegregation”. The reasons for this failure have long been more apparent than the solutions. High-income and middle-class white parents have moved in droves to suburban school districts that are outside the reach of city ones, thereby using the housing market to buy a better education for their children. Other affluent families have quit the public system entirely, and use private schools instead. And even though many white children still attend public schools in cities, big gaps in wealth—and in parents' ability to work the system—force school administrators to adapt constantly if they want to keep their schools racially integrated. Louisville at least manages to include the suburban bits of Jefferson County in its school district. In many American cities, especially in the north-east and Midwest, middle-class parents can choose from a variety of separate districts in nearby suburbs, leaving struggling cities behind. Nothing can be done about this because the Supreme Court ruled in 1974, in Milliken v Bradley, that desegregation cannot be required across school district lines, even if it is compulsory within them. That decision left the door wide open for white flight, and marked a constitutional limit for America's drive to integrate its schools. The city involved in the Milliken decision, Detroit, has been left with one of America's starkest racial divides between city and suburbs, and the quality of the city's public schools has collapsed. The question facing many school boards now is whether to keep focusing intently on the racial mix of each school, or to pour their energy instead into offsetting the disadvantages faced by any child, regardless of colour, whose parents are poor, uneducated or just hopeless. The Supreme Court may soon make this decision for them, in its rulings on Seattle and Jefferson County. But even if the court issues a vague or flexible opinion, a growing number of school boards have been considering an alternative approach to improving equality. The Wake County school district in North Carolina, for example, began mixing students from different economic backgrounds together in 2000, instead of continuing to integrate them by race. Some 40 districts across America now do something similar, often using the receipt of free or reduced-price lunches as a simple proxy for low-income status. Wake County, which includes the city of Raleigh, does not reassign students individually. Instead, it divides its district into hundreds of “nodes”, each one classified by the number of children who qualify for lunch subsidies. It rebalances schools by moving entire nodes at once, which both avoids singling out poor children and lets neighbourhood friends stick together. The goal is to ensure that no school in the district has more than 40% of its students on free lunches, or more than 25% performing below their grade level. The county's schools perform well. And despite overcrowding and a population that is 27% black and 45% non-white overall, affluent white families are still pouring into the district and enrolling their children in its public schools. True, the rapid growth is taxing the district's capacity and stirring lots of complaints, but many other urban school districts would love to have too many rich white kids. The Wake County model will tempt many other school boards if the Supreme Court forces districts to scale back or dismantle race-based integration schemes. But its new approach is not the only reason for its success. It previously had a good history of integrating schools racially with support from parents, and had made extensive use of magnet schools—which offer variety and innovation—to draw white students back into Raleigh. Teachers in North Carolina are not unionised. And the county was always well off economically. This point often gets lost in debates about school vouchers, choice and the role of competition. At the core of that debate lie competing theories about what disadvantaged students need most. Voucher advocates argue that they need their own money to spend, so that schools will compete over them. Many voucher opponents, by contrast, believe that what poor (or black) children need most is access to rich (or white) children every day in the classroom, along with all the advantages that affluent and involved parents bring to their children's schools. They favour spending more money on schools and teachers' salaries, but fear that competition from outside the system would undermine integration. Both arguments, however, have a debatable premise in common. They assume that the main educational goal of America's voters and policymakers is to improve the lot of children from low-income families, who tend to be the slowest learners. Many pressure-groups pay lip-service to this notion only to win support for schemes which they prefer for other reasons. In America's current political environment, pandering to middle-class gripes appears far more popular than really helping the poor. So the odds that any education reform with voters' support will genuinely be aimed at poor children seems depressingly low these days—whatever the Supreme Court rules, and however many years have elapsed since Brown. OAXACA, Mexico -- The slowing U.S. housing market already has taken a bite out of the U.S. economy. Now, the fallout is spreading to Latin America. That's because home construction is the principal gateway industry for immigrants entering the U.S. labor market. Those immigrants contribute the lion's share of the estimated $50 billion in cash sent annually from the U.S. to family members and others in countries south of the border. That tide of cash appears to be ebbing. Monthly remittances from the U.S. to Mexico have dropped every month since their peak of $2.6 billion in May 2006 -- shortly before new-home construction in the U.S. plunged. In February 2007, the latest month for which data are available, remittances to Mexico had slowed to $1.7 billion. Mexico, Latin America's remittance leader, may be a leading indicator of a trend unfolding across the continent. In a recent study of 15 Latin American economies tracked by BCP Securities of Greenwich, Conn., all but three showed better than a 90% correlation between the ebb and flow of U.S. housing starts and the swelling and shrinkage of remittances as recorded by the nations' central banks. "The contraction in remittances will dampen domestic consumption and hamper [economic] growth rates" in countries ranging from Mexico to Colombia to those in Central America, said the study's author, BCP Securities economist Walter Molano. The recent falloff in remittances reverses a long-standing trend in which a slowdown in Mexico's economy led to an uptick in remittance revenue as Mexicans migrated north to replace jobs lost at home, Morgan Stanley's chief Latin America economist Gray Newman says. But with U.S. housing market slowing, that safety valve may close. "If continued, Mexico's consumers could find themselves with less of a shock absorber, which has helped smooth out business cycles in recent years," Mr. Newman wrote in a report last week. Record low unemployment during the Clinton years helped draw undocumented Mexican workers, then mainly employed in agriculture, into construction and other service industries. With the housing boom, wage differentials, which used to favor farm work, started to tilt toward the building trades, attracting even more labor from Mexico. Data showing what appear to be fewer illegal crossings at the U.S.-Mexico border adds to the evidence of a housing-related plunge in remittances. Apprehensions of attempted crossers are down just over 10% during the first quarter of this year from the same period in 2006, according to federal law enforcement. The Bush administration claims the decrease is because of tighter border security. But those on the Mexican side say traffic has slowed for a simpler reason: There are fewer jobs waiting for those who make it across. The pain of a U.S. housing slump affects people such as Donato Diaz in the tiny village of Santa Gertrudis Zimatlan, in southern Oaxaca state. He returned from the U.S. in 2000 after spending more than a decade building homes in California's sprawling suburbs. Mr. Diaz used the money he made there to build his own construction-supply store. However, its fortunes depend heavily on cash transfers from Mexicans still working up north to family members here, who use the money to improve their homes. Mr. Diaz's business is suffering now. In 2003, he says, he bought a dump truck to haul sand to construction sites. During the past few years, the truck made seven or eight deliveries a day. Now? "We do two loads a day," Mr. Diaz says with a sigh. Between 2000 and 2006, almost 20,000 Hispanic laborers entered the U.S. construction work force in just one occupation: cement mason. Another 72,000 became drywall hangers and 140,000 more as painters, according to figures from the U.S. Bureau of Labor Statistics. The vast majority of these new job holders were foreign-born and crossed the border illegally, according to the Pew Hispanic Center in Washington. As housing starts slow, recent hires on construction sites are the first to lose their jobs -- and the first to warn relatives back home not to bother with a risky border crossing until the job picture improves. How many Mexican workers have lost their jobs? Most immigrants send an average of $1,000 a month back home, and Mexico's remittances are down by about $600 million, representing earnings from about 600,000 workers. Many of these workers rely on day-to-day employment through small, family-owned subcontractors, whose hirings and firings don't surface in overall job-loss statistics. Trouble in the U.S. housing market could also affect other industries staffed by immigrant labor. The carpet industry, for instance, is dominated by various nationalities at different points in the chain: Many Mexican workers are employed in factories that make rugs, Central Americans dominate the carpet-installation business and Brazilians have carved out a niche in rug cleaning. Little wonder, then, that remittances from the U.S. are dropping off almost everywhere in Latin America. Brazil received $330 million in remittances from the U.S. in February compared with about $446 million per month on average a year ago. Monthly remittances to Guatemala, which peaked last May at $361 million, dropped to $271 million in February. The slowing housing market also weighs on remittances in other ways. U.S. homeowners are likely to compensate for rising mortgage payments by cutting back on services that employ large numbers of immigrants, such as housecleaning, landscaping and laundry. Homeowners may also cut out frills such as visits to restaurants and beauty salons, big employers of immigrants. As Gordon Hanson, a labor economist at the University of California at San Diego puts it: "Among nonessential expenditures that higher mortgage payments might eliminate, getting the nails done might be at the top of the list." Family breakdown is youths' biggest challenge. These youth polled are optimistic and are in favor of rights for immigrants: "An overwhelming 82% of respondents say they support giving illegal immigrants a chance to earn legal status and citizenship." Things are changing in so many ways. The family structure issue is serious; other indices are promising. SAN FRANCISCO -- Family breakdown is the biggest challenge youth see facing their generation, according to a poll of youth released by New America Media (NAM) Wednesday, April 25th. It trumps the war in Iraq, global warming and even stress about school. NAM, which has been conducting multilingual polls for its ethnic media network since 2002, commissioned Bendixen & Associates to conduct the first ever cell phone survey of young people in California. The poll reveals a deep yearning among 16 to 22 year olds for traditional structures -- marriage, parenthood, religion and the benefit of a college education. At the same time, respondents (59 percent of whom are youth of color and 49 percent immigrants or the children of immigrants) show post-minority attitudes about race and ethnic differences. "These young people represent the forefront of the cultural continuum," says Sandy Close, executive director of New America Media. "To gauge their hopes, fears and perspectives about the future is to glimpse who we are becoming as a society." Anti-immigrant sentiment is a more critical issue for this generation than racism or discrimination, the poll concludes. An overwhelming 82% of respondents say they support giving illegal immigrants a chance to earn legal status and citizenship. "One of the most diverse generations this nation has known is also one of the most inclusive, and that sends a very powerful message to the state," says NAM Contributing Editor and award-winning journalist Nell Bernstein. Silicon Valley DeBug Magazine Youth Coordinator Raj Jayadev says young people have "taken what has once divided us - race, ethnicity, and gender - and used them to bring us closer. Never has a generation made carrying multiple identities look so easy." Nearly all (87%) are open to marrying or entering into a life partnership with someone of a different race. "Overall, these young people reflect the optimism of the American Dream," says Close. "They believe they will attend college and do better than their parents. That may also reflect the optimism of their parents, many of whom immigrated here to give their children a better life." Nationally recognized pollster Sergio Bendixen conducted the poll, commissioned by the New America Media (NAM) and co-sponsored by the University of California Office of the President. The pollsters surveyed 601 Asian, African American, Latino and White youth in English. A study blames working conditions. Higher pay isn't the answer, it says. As a mid-career professional with a doctorate in chemistry, Maurice Stephenson appeared made to order for the Los Angeles Unified School District, especially because he was eager to teach at a high-poverty campus in a system woefully short of qualified science teachers. But the honeymoon ended abruptly after less than two years. Fed up with student insolence and administrative impotence, he stalked out of Manual Arts High School on March 12 and never went back. Few teachers quit so dramatically, but leave they do. In California, teachers are departing the profession in alarming numbers ˜ 22% in four years or fewer ˜ but simply offering them more money won't solve the problem, according to a report released Thursday. The real issue is working conditions, which are the flip side of a student's learning conditions, said Ken Futernick, who directs K-12 studies at the Center for Teacher Quality at Cal State Sacramento. His study, which was based on a survey of nearly 2,000 California teachers, maps a growing crisis that fundamentally affects student learning. The study also casts doubt on commonly pursued remedies both for the teacher shortage and student achievement in general. Classroom interruptions, student discipline, increasing demands, insufficient supplies, overcrowding, unnecessary meetings, lack of support ˜ all play a role in burning out teachers. "They're not just driving teachers crazy; they're driving teachers out of the classrooms," Futernick said. Stephenson is among the 35% of L.A. Unified teachers who quit within five years, according to school district data. And as in most other cases, salary wasn't the primary factor. In fact, L.A. Unified's data lists salary as the No. 9 reason why new hires leave. No. 1 is "moving." But also cited are "lack of support from administrator," "student discipline policy" and "unmotivated students." Those results are consistent with Futernick's findings: "When teaching and learning conditions are poor, we discovered that many teachers see their compensation as inadequate. When these teaching and learning conditions are good, not only do teachers tend to stay, they actually view their compensation as a reason for staying." The findings suggest that when teachers unions advocate primarily for salary, they have it somewhat wrong. On the other hand, Futernick said, administrators are clearly misguided when they focus single-mindedly on getting rid of "bad teachers." That issue pales in importance to teacher retention. Moreover, at a struggling school, "one is hard-pressed to know the good teachers from the bad. Such a place is not conducive to good teaching," he said. At high-minority and high-poverty schools, teacher turnover typically runs at 10% annually. "If this churning is going on, you can be sure you have a dysfunctional school," Futernick said. "As long as we think of these schools as combat zones, we'll never solve the retention problem and we'll never close the achievement gap" between white and Asian students and their black and Latino peers. Indeed, some researchers have cited the quality of teaching as perhaps the single most important factor that affects student achievement. High-poverty schools have the additional hurdle of a more limited teaching applicant pool, and they are more likely to have teachers who work outside their field of training. By some estimates, about $455 million per year is squandered in teacher training in California because of premature departures. Vastly improving teaching conditions probably would cost much more. "We have a high-school dropout problem," Futernick said, "in large part because we have a teacher dropout problem." Stephenson, 52, had two pressing complaints at Manual Arts. For one, he said, 39 students were enrolled in a lab class that he said could safely hold only 30. Then there were the students themselves. "They were showing up to class totally unprepared, with no pens, no pencils, no paper to work with," he said. That was particularly irksome, he said, because students could obtain free supplies from a school office. When he did that errand for them, fellow teachers chastised Stephenson for enabling bad student behavior. Meanwhile, he said, the message from the administration was: The students are staying. Make the best of it. When the new term started in March, Stephenson took a different tack: "I gave them one week to get all the materials they needed so they could do all their work." They ignored him. He walked. So was this teacher worth keeping? Other instructors at the same school have inspired their students. And at a school where freshmen outnumber seniors 3 to 1, any student inside a class could be considered a striving survivor. District officials had no immediate response to Stephenson's account. A teachers union official insisted that Stephenson had a solid reputation among instructors. He became a teacher after years as a science consultant to grant writers and contractors seeking government work. Officials from L.A. Unified, the largest school district in the state, insisted that they were focusing on the teacher retention problem as never before. The school system has increased its percentage of credentialed teachers to 94% from 78% in the last four years. It also offers pay incentives for teachers in needed fields and for teachers who go to hard-to-staff schools. The teacher vacancy rate is at an all-time low, said Vivian Ekchian, the district's deputy chief of human resources. Also, at 22 high schools, including Manual Arts, the district has assigned a full-time teacher to help struggling colleagues and provided a pool of substitutes who attend staff meetings and work at the campus full time. Teachers union President A.J. Duffy is unimpressed: "L.A. Unified is very good at creating the illusion that they're on it and that things are getting better ˜ and we don't believe that anymore. Which is why our thrust is local control of schools with accountability." That view has some resonance with academics. California, in its desire for accountability, has made education ever more bureaucratic, rule-oriented and regimented, said Stanford University education professor Susanna Loeb at a conference last week. Special-education teachers are inundated with paperwork and other stresses that push them out of teaching or at least out of teaching the disabled. "I told everybody I would teach as long as it was fun," said Barbara Millman, who left her teaching job at a school in San Pedro for the severely disabled at age 63. "They kept squeezing more kids into a class and trying to get by with less assistants. I felt the kids were not getting the kind of attention they needed and that we also were not valued as experts." Other states, including Arizona, Nevada and North Carolina, use teacher survey information in ways that California does not, Futernick said. North Carolina, in particular, has adopted workplace standards that protect teachers from unnecessary interruptions, paperwork and meetings. Such standards seem a universe apart from the experience of a former Los Angeles middle school teacher who said she taught at a rodent- and roach-infested campus where students read at a second-grade level and frequently wandered the grounds because no one made them go to class. "It got to the point where my morale was so low, and I cared so little that I would show up 15 minutes late, with my students waiting outside. No one ever said a word to me. I was still a star," said the former teacher, who asked not to be named because she has returned to the school system for a job outside the classroom. She had to leave the classroom because "I saw myself turning into the others. What we attract are the martyrs and the lazy, and the conditions perpetuate it." For the report, go to http://www.calstate.edu/ teacherquality/retention. Note: Responses are from 220 current and former California teachers who participated in a 2005 online survey by the California State University Center for Teacher Quality. recently has laid off 13 staffers. good place as far as staffing goes." in line with our revenue." agency will make up the difference the following year. the previous year, Graves said. 'Oh, I'm expected to come to school,' " she said. "into mutually hostile states or groups." inability to create the nation. need not talk about Palestine, Yemen or Arabia. the United States. Many in both societies believe they are under siege. countries and holding full rights but not the same culture or worldview. become a huge, influential minority demanding respect and equal rights. For many years, the United States used and abused its southern neighbors. the shortage of construction labor. century with a multicultural, multicolored population. to appreciate their foods, tastes, cultures and looks. areas. Uyghurs and Tibetans will soon vanish as indigenous peoples. Balkanization of Europe and the United States. Sacramento — Sen. Jack Scott, a career educator, remembers when his daughter broke the news that she was going to marry a commercial fisherman. "This guy was not too happy," the Altadena Democrat says, referring to himself. His daughter's suitor "was not highly educated; he'd never gone to college," recalls Scott, who at the time was dean of instruction at Orange Coast College, and later would become president of Cypress College and then Pasadena City College. Scott's attitude reflected the typical academician's mind-set of the day — indeed, much of society's. If you weren't a rock star, a big league athlete or a rich heir, you needed a four-year college degree to become a success. Short of that, you were doomed to be second class, if not a failure. The senator's view has changed, in no small part by watching his son-in-law Paul, whose father and grandfather also had been commercial fishermen. Paul went to Alaska, bought his own boat, then another, and acquired an interest in a third. He fished for cod, pollock, halibut and crab in the Bering Sea. He worked and froze his rear off and "made enough to retire at the early age of 42," Scott says with admiration and amusement. "The lesson is," the lawmaker continues, "we find our own self-fulfillments. We make a real mistake if we think everyone is going to receive their self-fulfillment by studying humanities or pure math. They may get self-fulfillment by being good plumbers or auto mechanics or nurses. Or commercial fishermen. We've got to design our courses to meet the needs of these people. "If not, they'll just drop out." And that is what they've been doing. In California, roughly a third of ninth-graders eventually drop out of high school. In L.A., it's around one-half of blacks and Latinos. A Gates Foundation survey of high school dropouts nationwide found that 88% were getting passing grades. So most must have left school because they were bored. One major reason they're bored in California is that classwork doesn't seem to bear any relationship to whatever they envision as their life's work. It relates primarily to getting them qualified to enter the state university system, which many either aren't interested in or consider a pipedream. Only around 20% of ninth-graders ever will graduate from a four-year college. Meanwhile, there are hundreds of thousands of students each year who could be learning middle-class job skills — as future nurses, auto mechanics, computer programmers, home builders. Name it. There are some successful school-business training partnerships, but not nearly enough. There's a shortage of skilled workers in California, business groups contend. Our public schools used to offer many vocational education courses — metal shop, drafting, etc. — that have been drastically reduced in recent decades. In 1987, three-fourths of high school students took at least one voc ed class. By 2005, only one-third did. "Those great shop classes have disappeared," says state Sen. Tom Torlakson (D-Antioch), a former teacher who intends to run for state superintendent of public instruction in 2010. "That's a tragedy. Because those classes motivated students to stay in school." The classes have disappeared because of two primary reasons: First, the elitist attitude that it's on to the university or bust; everybody else just get out of the way. Second, voc ed courses, with all their equipment that constantly needs updating, aren't cheap. They're among the first to land on the chopping block whenever state politicians face one of their periodic budget crises. "The notion of voc ed went out of favor with many education bureaucrats," says Sen. Mark Wyland (R-Escondido). "What's tragic is that while all other industrialized nations have highly developed systems, our existing system has been battered. "It was replaced by a notion that was well intentioned, but utterly foolish and communicated incessantly that the only thing of value for a young person is a college degree. Not only that, the message was that you're not of value unless you're going to college. The name 'voc ed' connoted being less worthy." But voc ed now is making a comeback under a new euphemism: career tech. It's not the top priority at the Capitol, but it is a priority. Scott, Torlakson and Wyland all have introduced legislation aimed at upgrading career tech. Scott has a bill to simplify credentialing for career tech teachers and provide more flexibility in what they can teach. Wyland wants to eliminate the requirement that voc ed teachers have a bachelor's degree. Torlakson proposes requiring every high school student to take at least two career tech courses. The $10.4-billion school construction bond approved last year by voters contained $500 million for career tech facilities. There's also $52 million in Gov. Arnold Schwarzenegger's proposed budget for various career tech programs. The trick will be keeping it there, since the state is spending with red ink and tax revenues have been falling below expectations. But the public will back the politicians' spending on career tech. A poll being released today by the Public Policy Institute of California shows that 67% of adults consider career tech curricula to be "very important." The figure is even higher, 71%, for parents with kids in school. Schwarzenegger has been promoting voc ed. "I myself," he told a "summit" on the subject last month, "am a product of career tech education. Between the time I was 15 and 18 I went to school in Austria to learn how to be a salesman." An estimated 30,000 undocumented immigrants who aren't Latino live a more native-born life in New York. Woodlawn, The Bronx - IMAGINE HILLARY Clinton holding up a T-shirt that read: "Legalize Mexicans." That's not going to happen, right? Well, last month in Washington, at a rally hosted by the Irish Lobby for Immigration Reform, the leading Democratic candidate for president actually did have her picture taken holding a shirt that read: "Legalize the Irish." That's the lobby's in-your-face slogan, which says a lot about the role that race (and ethnicity) plays in the debate about illegal immigration. Latino activists bend over backward trying to cloak undocumented Mexican migrants in the slogan "We are America," but their Irish counterparts don't feel similarly obliged. There are an estimated 50,000 Irish illegal immigrants in the U.S.; 30,000 of them are thought to live in New York City. Today, this tiny corner in the northern reaches of the Bronx is perhaps the most heavily Irish-born neighborhood in New York, and advocates believe that as many as 40% of local immigrants are undocumented. On Tuesday afternoon, I walked up Katonah Avenue, Woodlawn's main shopping street, trying to guess who was or wasn't here illegally. How about that blond woman walking with her child? Or perhaps the redhead in pink sweats? Surely the two rough-hewn construction workers enjoying a lunchtime beer at the Rambling House bar didn't have papers. Like the woman I met in California's Central Valley a few months ago who told me how odd it had been to see white people engaged in farm labor in Australia, it was a decidedly new sensation for me to suspect all the white people around me of being illegal. "When I tell people I'm undocumented, it shocks them," said Mary Brennan, a nurse's aide who has lived in the U.S. for almost 17 years. "They think of JFK or Ronald Reagan, and they can't understand how an Irish person could be illegal." Though Brennan shares the hardships of undocumented status with other illegal immigrants throughout the country - last year she was unable to attend her brother's funeral in Ireland for fear that she'd be denied reentry to the U.S. - she acknowledges that Irish illegals do have a slight advantage. It's all in the stereotypes - race-based, language-based, class-based. Her friend, contractor Dermot Byrne, who also is here illegally, agrees. "From my experience, we're not singled out. If someone's driving down the street and they see five Mexican guys on one side and five Irish guys on the other, they're going to think that the Mexicans are illegal, even though it could be the other way around." Despite his status, Byrne has placed a pro-immigration-reform sticker on his car, as well as Irish versions of an "I love Jalisco" decal that identify his and his wife's home counties in the old country. Irish immigrant advocates are acutely aware that the American public doesn't identify the Irish as alien, let alone illegal, and they consciously leverage this positive prejudice to their advantage. "The fact that they're white Europeans agitating for immigration reform is helpful," said Niall O'Dowd, chairman of the Irish Lobby for Immigration Reform and publisher of the Irish Voice newspaper. "Bottom line is that every ethnic group brings their own strength to the debate. We can't put a million people in the street, but we have positive political identification and a lot of access to Democrats and Republicans." There are 40 million Americans of Irish descent, and O'Dowd believes that a good portion of them, particularly the politicians, are sympathetic to the plight of illegal Irish immigrants. His office is filled with snapshots of him shoulder to shoulder with the likes of John McCain, Bill Clinton and Ted Kennedy. "The key is to have sympathetic politicians of the same ethnic background," he said. Seeking to put a white Irish face on the issue of illegal immigration, O'Dowd and the Irish Lobby sent a delegation of 3,000 undocumented workers to Washington last month, not to protest but to lobby U.S. lawmakers. "We Irish are good at playing politics from the inside," he said. "When politicians see that even the Irish can be undocumented, then they realize that there's something wrong with the immigration system." But whites' more favorable view of illegal immigrants who look like them may not translate to the growing number of Americans whose ancestors do not hail from Europe. The Pakistani-born cab driver who took me from the subway station to Katonah Avenue said he generally found Irish immigrants to be nice, as well as good tippers. "But they won't rent you an apartment around here if you're not Irish," he said. "They don't want to mix with other races." Officials profited from reading first program. The Education Department's inspector general, John P. Higgins Jr., said he has made several referrals to the Justice Department about the five-year-old program, which provides grants to improve reading for children in kindergarten through third grade. Higgins declined to offer more specifics, but Christopher J. Doherty, former director of Reading First, said in an interview that he was questioned by Justice officials in November. The civil division of the U.S. attorney's office for the District, which can bring criminal charges, is reviewing the matter. Doherty, one of the two Education Department employees who oversaw the initiative, acknowledged yesterday that his wife had worked for a decade as a paid consultant for a reading program, Direct Instruction, that investigators said he improperly tried to force schools to use. He repeatedly failed to disclose the conflict on financial disclosure forms. "I'm very proud of this program and my role in this program," Doherty said in the interview. "I think it's been implemented in accordance with the law." The management of Reading First has come under attacks from members of both parties. Federal investigators say program officials improperly forced states to use certain tests and textbooks created by those officials. One official, Roland H. Good III, said his company made $1.3 million off a reading test, known as DIBELS, that was endorsed by a Reading First evaluation panel he sat on. Good, who owns half the company, Dynamic Measurement Group, told the committee that he donated royalties from the product to the University of Oregon, where he is an associate professor. Two former University of Oregon researchers on the panel, Edward J. Kame'enui and Deborah C. Simmons, said they received about $150,000 in royalties last year for a program that is now packaged with DIBELS. They testified that they received smaller royalties in previous years for the program, Scott Foresman Early Reading Intervention, and did not know it was being sold with DIBELS. Members of the panel said they recused themselves from voting on their own products but did assess their competitors. Of 24 tests approved by the committee, seven were tied to members of the panel. "I regret the perception of conflicts of interest," said Kame'enui, former chairman of the committee, who now works at the department as commissioner of the National Center for Special Education Research. "But there was no real conflict of interest being engaged in." Staff writer Carol D. Leonnig contributed to this report. Opponents say people who break the law shouldn't get tuition break. Julieta graduated with honors from Anderson High School, overcoming limited English skills and other obstacles to draw the notice of Yale and University of Spain recruiters. Now chasing her dream to become a nurse practitioner — and a master's degree at the University of Texas — Julieta perennially makes the national dean's list and the president's honor roll and carries a shiny 3.9 grade point average. "I like school," she said with modest understatement. On Thursday at a hearing before state lawmakers, the 26-year-old Austin woman joined a parade of speakers testifying on proposals to repeal a Texas law allowing certain illegal immigrants to receive cheaper in-state tuition rates at state universities. Julieta said before the hearing that her dream would be impossible if she had to pay the more expensive tuition rates charged to non-Texas residents. She said she pays about $4,000 a semester in tuition for three classes, the same amount she would have to pay for just one class under the out-of-state rates. "And even that's a lot for me," said Julieta, who asked that only her first name be used because she's not a legal resident. When the Legislature enacted its groundbreaking tuition law in 2001, Gov. Rick Perry and supporters hailed it as an investment in Texas' future and a compassionate way to help immigrants attend college. "It's probably one of the most heralded things that our state has done in the area of higher ed" said Rep. Rick Noriega, D-Houston, who authored the 2001 tuition measure. But with Congress unable to find solutions to illegal immigration, state legislatures are struggling to decide whether to extend or deny in-state tuition to illegal immigrants. Since Texas enacted its law, nine other states have passed similar laws, and three have restricted access. "I think the people of my district are demanding that we do something regarding illegal immigration," said Rep. Debbie Riddle, R-Tomball. "They're demanding that both federal and state governments do something about securing our borders . . . and they're incensed that illegal immigrants are getting in-state tuition." Riddle's House Bill 104 would stipulate that only legal residents be eligible for in-state tuition. It was among a handful of similar proposals considered late Thursday by the House State Affairs Committee. Riddle said her proposal would not prevent undocumented immigrants from attending state universities, "but they're going to have to pay (the more expensive) tab." Lawmakers were still hearing testimony late Thursday night from dozens of speakers, many of them college students in business attire. An overflow crowd required some to watch the proceedings on television in another room. Before hearing testimony from the public, several House Democrats buffeted Riddle with questions in sometimes emotional exchanges. Riddle said her proposal sticks up for "hard-working, middle-class people" who are struggling to pay their mortgage and other bills and footing the cost of their children's educations. "I think that it is fundamentally wrong for the state to take money out of their pockets in order to pay for someone who is not here legally to go to our state universities," Riddle said. "It depends whose pocket you're talking about," said Rep. Jessica Farrar, D-Houston. She and other legislators said undocumented immigrants also pay income and sales taxes. Like other opponents of in-state-tuition laws across the country, Riddle says they give preference to illegal immigrants. Groups have challenged in-state-tuition laws in California and Kansas, arguing that a 1996 federal law bars states from allowing cheaper tuition for illegal immigrants without offering the same to nonresidents. Courts upheld both laws. State officials, however, say the requirements for in-state tuition apply to all students, regardless of their legal status, so Texas is not violating federal law. To qualify in Texas, students must live in the state at least three years continuously before graduating from high school or receiving the equivalent of a diploma. Students who are not citizens or permanent residents of the United States must declare an intention to seek legal resident status as soon as they are eligible. Since it was enacted, 11,130 students have used the law to qualify for the cheaper tuition. The total includes undocumented students and legal residents, according to the Texas Higher Education Coordinating Board. Before the hearing, Noriega disagreed with Riddle's contention that in-state tuition burdens taxpayers. He said Texas invests $100,000 per student to provide a primary and secondary education. "When you have students that we know have a higher degree of education, they're able to contribute back to the economy," Noriega said. "It just makes sense for us to protect our economic investment." Public policy merits often get lost in the highly emotional debate about illegal immigration, said Josh Bernstein,q federal policy director of the National Immigration Law Center, an immigrant advocacy group. "We need to recognize that there are competing values involved, all legitimate, I think," Bernstein said. Although it is true that some students receiving in-state tuition rates aren't authorized to be here, Bernstein said, it's also important to consider that they are the brightest overachievers, who overcame poverty, unfamiliarity with English and other obstacles to excel in high schools. Many immigrant advocates argue, too, that undocumented students shouldn't be penalized for the decisions their parents made to enter the country illegally. But, Riddle said, "I don't think anyone is being penalized here with repealing the law." Julieta said before the hearing that she was 11 when she came to the United States with her mother and sister. Her mother was a victim of spousal abuse. When her parents divorced, her mother couldn't sustain the family on a single income in Mexico City. Undocumented students aren't asking for special handouts, Julieta said. "We want to become someone." A slow-motion scandal surrounding a federal multibillion-dollar reading program has its first congressional hearing this week, but it remains to be seen whether the scrutiny will shed any new light on a complex, contradictory tale of textbooks, tests and allegations of federal arm-twisting. A key part of President Bush's efforts to remake public education, Reading First was launched in 2002, giving schools $1 billion a year to improve reading in early elementary grades. Five years later, early evidence suggests that it may be helping. But investigators say a handful of advisers have railroaded schools into buying textbooks and other materials that they and associates developed. The result: a conflict-of-interest case that took two years to jell as investigators in the Education Department connected the dots. To date, no criminal charges have been filed, but Democrats, now in control of Congress, promise to give the case a full airing. "The purpose of Reading First is to help schoolchildren learn to read, not feather the nests of a select group of well-connected individuals and organizations," says Rep. George Miller, D-Calif., who chairs the House Committee on Education and Labor. Miller and Sen. Edward Kennedy, D-Mass., are conducting probes. Kennedy plans hearings later this spring. Miller will preside at the first hearing Friday, which brings together Chris Doherty, the program's former director, and three top advisers. Atop the witness list: John Higgins, the Education Department's inspector general, who has issued six reports detailing how Reading First leaders and contractors looked the other way at possible conflicts of interest among advisers and others — several of whom authored textbooks. He also found that Doherty and others strong-armed states and school districts into choosing from a small selection of materials that stress phonics. In one e-mail Higgins cited, Doherty said of a publisher whose books downplayed phonics, "They are trying to crash our party, and we need to beat the (expletive) out of them in front of all the other would-be party crashers who are standing on the front lawn waiting to see how we welcome these dirtbags." Doherty quit in September after the report's release. Higgins also found that a 2002 conference for educators focused too exclusively on a few programs, creating what investigators said was a perception that there was an "approved list" of texts. A related probe last month by the Government Accountability Office found that officials from 10 states complained that the Education Department told them to eliminate reading programs or tests that they didn't endorse. Federal rules prohibit the department from endorsing any curriculum. Education Secretary Margaret Spellings, who until 2005 was a White House domestic policy adviser, says the troubles occurred before her move to the Education Department. But Mike Petrilli, a former associate deputy secretary under Spellings' predecessor, Rod Paige, says Spellings "micromanaged the implementation of Reading First from her West Wing office." She already has told lawmakers she is beefing up oversight of the program. But even a few critics cautiously concede that the program has been a boon to schools. The Center on Education Policy, a Washington think tank that has criticized Bush's education programs, in September said Reading First is having "a significant impact" in schools. A five-year, $30.5 million evaluation, begun in 2003, should produce complete results next year. Cindy Cupp, a Savannah, Ga., educator, was among the first to complain in 2005, after Reading First schools in Georgia passed over her homegrown phonics program. Cupp compiled a huge dossier outlining the links between publishers, federal advisers, universities and the Bush administration. In findings issued last January, Higgins largely upheld her complaint. She says it's irrelevant whether Reading First works: "To rationalize breaking the law by saying the program has been effective is just that — a rationalization." She also notes that part of the evaluation bid went to RMC Research Corp., which Higgins cited for turning a blind eye to conflicts of interest among three top advisers it hired. All three are scheduled to testify Friday. Interestingly, the left and the right are against renewal, while Bush, Kennedy and George Miller, are all determined to pass the federal NCLB legislation. They present concerns raised about NCLB as a failure to get the teacher groups to support the law. Instead of pointing fingers, our leadership really needs to take a hard look at the problems caused by the the law and the punitive system it has engendered. education is fundamentally a prerogative of state and local government. undermine the effort in both parties. provide states federal financing to meet its requirements. "unsustainable" and want an overhaul. because of too much testing." Representative George Miller of California. revision could be postponed until after the 2008 election. scores consistently fall short of achievement targets. one requiring additional testing in high schools. Mr. Kennedy and Mr.
channeling federal help to schools that the law identifies as struggling. student's academic performance, at a cost of billions. introduced companion legislation in the Senate. providing less money than promised. from across the country for us to improve this law," Mr. Miller said. Democrats. He can count on support from business and civil rights groups. to bring down the law," he said. Arizona where all four House Republicans have signed on to Mr.
said: "We're optimistic about getting N.C.L.B. reauthorized this year." the law, and their views are influential with Congressional delegations. law must be given in English. make an allowance for Arizona, facing an endless flow of new immigrants. Education in Washington," Mr. Horne said. teacher with a math degree to pitch in and teach, say, geography. Patti Harrington, the state superintendent of public instruction. said he shared her view. be fixed," Mr. Larson said. Bush Elementary School fifth-graders took the first round of math TAKS Tuesday. In two weeks, Principal Jill Arthur will find out how her students did. Meanwhile, she waits, but she's not the only nervous one. "It is very high stakes. We had vomiting today. That's what hurts my feelings," Arthur said, adding the pressure on the students is what makes them physically ill.
Arthur was expressing her personal viewpoint on state-mandated testing as part of a Midland League of Women Voters forum on the subject held at Emerson Elementary School. The panel also included Midland High School Principal Linda Jolly and Emerson Elementary teacher Donna Byerlotzer. Arthur said she believes all students can learn, but they may not acquire knowledge at the same pace. "I'm going to be very curious in a few years to see what happens with our dropout rate. I'm very concerned to see what happens to these students in the upper grades," Arthur said. If students don't pass TAKS the first time, they take it again, then a third time in summer school. 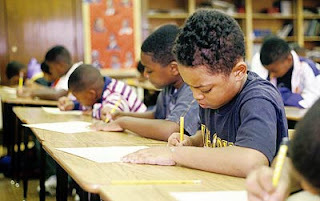 Should a student not pass the test in summer school, they could be held back. Officials said everything is done to intervene -- reading recovery, tutorials during and after school and on Saturdays. However, it's not always possible to get high school kids to come back for tutorials. Proposed legislation to replace TAKS with end-of-course exams is something Jolly endorses, although she doesn't agree with everything in the bill. Ninth graders in 2009-10 would be the first to take the test, should it be approved. The bill would implement 12 end-of-course exams -- three in each subject and testing would be conducted right after completing a year in that subject. A composite score of 840 would be needed to graduate, Jolly said. Jolly said she thinks the exam still needs to be field tested and she is skeptical the proposed exam can be offered via computer when there aren't enough computers to go around. The results would be available more quickly on computer, which she likes, but it also would require her to shut down school during testing periods. Although school officials agree accountability is necessary, Jolly said state and federal rules measure all student learning the same way, which she doesn't think is possible. To graduate, 11th grade students have to pass all four sections of the EXIT TAKS -- math, science, English/language arts and social studies. The greatest failure rates are in math and science followed by English/language arts. Social studies usually yields the most success, Jolly said. Recent immigrants, students who have been in the United States less than a year, enter high school and Jolly has a limited time to get them ready to take the EXIT test. Midland High offers English as a second language classes, but the number of students is too great for the teacher and aide assigned to teach the course. "We have a great teacher. We have a great aide, but we just don't have the manpower," Jolly said, adding what's needed is smaller classes. Teachers in attendance endorsed the state-mandated Texas Essential Knowledge and Skills but Arthur acknowledged some creativity has been taken out of education by the test. "Some of the creativity, the teachable moment has gone away," because we have these guidelines, she said. "I still think teachers can be creative. A lot of it has to do with leadership. There are many creative ways to teach inferences and vocabulary." TAKS has made teachers more effective, Emerson Principal Mary Smith said, but she doesn't like what's being done with tests now. She pointed out an article in the Reporter-Telegram about 44 Dallas teachers who could be fired for poor test scores. "Instead of using the test to evaluate where students are, we're using the test to drive our schools," Smith said. She added she wants every student at her school to earn commended performance. Byerlotzer echoed Smith's feelings that TAKS has its good points. "Because of TAKS, because of clearly stated objectives and a test to match," it shows teachers are doing their jobs and it's easier to plan her classes, Byerlotzer said. We have learned that it's likely that one or more of the bills filed to repeal the resident tuition for immigrant students under HB 1403 will be presented in a public hearing on April 16. We believe the Committee may also meet on April 12, but we think the bill(s) will not be heard until April 16. Time is short so I am mobilizing our network to do as much damage control as possible prior to that date. Recipients of this email can take action by sending a postcard or letter to the members of the House State Affairs Committee. It would be helpful if persons who might reside in the district of any of the members of the State Affairs committee... especially the chairman, David Swinford would write to their representative and express support for retaining access to higher education for ALL students. The other members are: Byron Cook, Ken Paxton, Dan Flynn, Corbin Van Arsdale, Tan Parker. All of them may be addressed at P.O. Box 2910, Austin, 78768. At the same time, cards or letters to the "leadership" (Governor, PO Box 12428, Austin 78711; Lt. Governor, PO Box 12068, Austin 78711; Speaker, PO Box 2910, Austin 78768) also are in order, especially the Speaker Tom Craddick Tell them you oppose any divisive debate in the state house on a federal matter, pointing out that the overwhelming testimony of business and attorneys at Wednesday's (Mar 28) joint hearing on immigration and border affairs was to the point that, first, state legislators have absolutely no concept of how complex are immigration laws and the unintended consequences of the ill conceived bills that have been filed; second, the problem must be fixed by Congress, not the Legislature; and third, that the state and the federal government need to provide sufficient funds and personnel to protect our borders form illegal traffic in both contraband and human beings. Texas business leaders also went on record, again, in support of continuing access to higher education for ALL students, as they are ALL critical to the future economic viability of this state. The Speaker might be especially sensitive to cards or letters from Tech students or graduates, and/or educators in the district. In 2001, the personal testimony of students to the Higher Education committee was a strong factor in the passage of HB 1403. Most of the State Affairs committee members are new to the legislature, certainly since 2001, and seven of the nine committee members are Republicans. If you are a student, or a teacher or professor who plans to bring students to Austin to testify at the hearing, please let me know as soon as you can. We would like to help make your experience at the capitol as comfortable and rewarding as possible, and perhaps coordinate disparate groups and help them make connections here. Email works best, easier to keep track of it, thanks. If you are a student or the teacher of 1403 students who would like to offer a personal statementœ how/when you came to Texas, your family, goals, achievements, dreams, etc. we would be happy to receive those statements either electronically, faxed or emailed. We will add them to those I already have and share copies with the members of the committee. They need not use their full name, if they wish. Statements or letters from teachers or anyone who works with these students are appreciated. Finally, I ask that you share this information with your friends and associates who support equal access to higher education for all the children in Texas, regardless of their place of birth, and ask them to do the same, spreading the word like ripples in a pond. These students are vibrant, highly motivated, over achievers usually, from families with strong faith and family values, and a strong work ethic. They are creative and entrepreneurial, involved in their community and church, and they usually want to go into professional disciplines that we needœ teachers in science and math, nurses, doctors, engineers, business and finance. Please help us protect their dreams. Call or email me at any time.